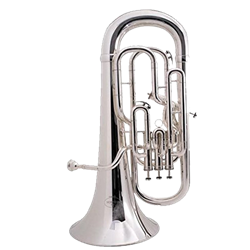 With the choice between these models (BE163, BE164 or BE165), the Besson New Standard euphoniums provide an excellent start for the careers of aspiring euphonium players. Modeled after the classic BESSON of years past, they are free blowing with an ease of tone production combined with an even response, excellent valve action, as well as being comfortable for both embouchure and fingers. The 3+1 valve system or 4 inline valve allow young players proper technique to allow transition to Sovereign or Prestige range. 3+1, 11" bell, silver-plated finish Besson has long been known as one of the finest names in brass instrument manufacture. The 100 series instruments are designed with the developing student in mind and offer great playability and performance at a very attractive price point. Also ideal for brass bands or banda playing, these instruments will return exceptional performance without breaking the bank. This instrument is in perfect condition. Ostensibly a display model, I see no signs it has ever been played. Case is included and perfect but we forgot to take pics of it. Pics tell the rest of the story.